Everybody wants to learn to do the big rock steps, hills, and other obstacles, but the simple fact is that most of the points lost in a trial are in the turns. Or else in the obstacles which are immediately preceded by a turn. Sloppy turning technique will make the obstacle much more difficult, because a good turn is essential to get set up properly. And if the ground is slippery or full of loose stones, a good basic turn is much safer than trying to hop the bike. The keys to good basic turns are to lean the bike into the turn with good body position so that the bike tracks through the turn and the rider is always in balance. You don’t want to turn by using traction of the front tire with the rear pushing against the front, because this makes the front tend to push. Proper turning technique really shows itself when traction is poor, as good technique will drive the bike through the turn in total control. Here’s a step by step guide to a good basic turns, with photos of TTC youngster Nathan Glinski during a recent class with Chris Florin. Chris picked out Nathan to demonstrate because of his good form and excellent technique on the basic body position for turning. A s you start the turn, lean the bike into the turn so that the bike turns itself and the wheels roll around the turn. 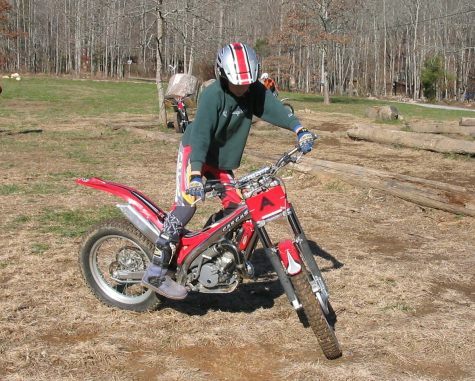 Initiate the turn using footpeg pressure, by pushing the inside peg to make the bike lean. We call this “steering with your feet” or “steering with the pegs”. 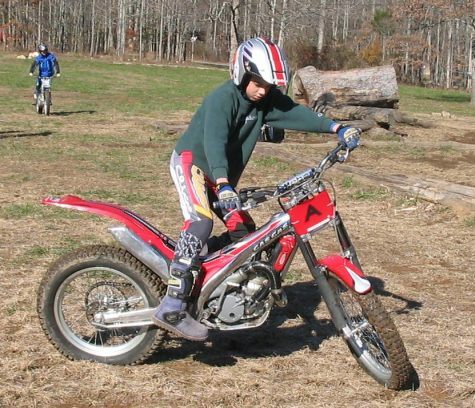 As the bike leans into the turn, the bike should rest against the inside leg for stability as Nathan demonstrates in photo 1. Note that he rotates his outside foot to the outside of the footpeg and rolls the ankle to allow the bike to lean more while maintaining his body position to the outside. The outside knee and outside elbow must be pointed outwards. As you can see in the photos, the hips are angled into the turn. The inside arm is straight, the outside arm angled, and the shoulders naturally rotate with the handlebars. Some people think about rotating the shoulders and let the arms naturally move into the correct position. The body weight moves to the outside and usually a bit towards the rear. The body may move a little bit front to back depending on if you’re moving uphill or downhill, but generally a bit towards the rear on flat ground. If you are properly balanced, you should be able to stop at any point in the turn without falling in (or out); this is a good point Ryan Young makes that can be a very helpful reminder. 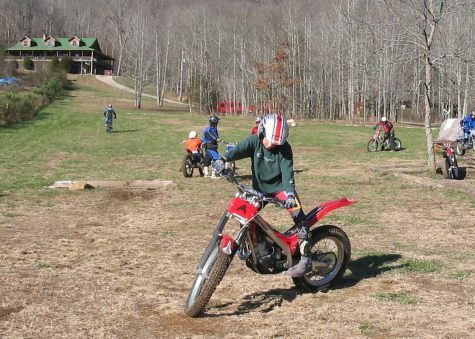 The most common mistake in turning is to let the head fall into the turn, which requires the rider to pick up the throttle and pick up speed to keep from falling into the turn. Look ahead to your next marker or visual cue in the section (you DID walk the section and plan some visual cues, didn’t you!). If you are looking down, all you see are the knobs passing the front fender and you will not be prepared to finish the turn. Use a smooth throttle (or brake if you’re going downhill) and keep it rolling while looking through the turn as Nathan shows in photo 4. To practice, set out some markers and tighten them up as you improve. It is absolutely the best practice to do this in the most slippery, greasy spot possible, as proper turning technique will work amazingly well in the mud and you will NOT be able to get away with poor technique when it’s slick. If it’s not slick, drag the garden hose out to a good spot in the back yard and make a slick spot! (don’t tear up the lawn). A creek bed of loose bobbley rocks is also a great place to practice. Do some figure 8’s to work on the transition from left to right to left. Remember to use peg pressure to lean the bike and “steer with your feet”. After practicing on flat ground, you can move to slight uphill or downhill turns to work on smooth throttle and brake control. Good basic turning technique is the foundation for developing trials riding skills. So always take some time to go back to basics and practice your turning techniques. Might come in handy at the Tennessee Nationals in April, where there just may be some slippery turns. See ya there!